Fitness Around Albany is a new mini series here on the blog where I write about my experiences at a variety local studios around Albany, NY and the Greater Capital Region. I started this series as a way to connect with local instructors, studios, and fitness enthusiasts in order to get to know the Albany fitness community. These are not sponsored posts, however I did receive permission from the studio owners to write about my experiences here. All of the studios in this series offer free first-time sessions, and/or have free-class coupons in local flyers or athletic stores. I plan to add to this series as I discover more classes in the area, and my hope is that if you are local or visiting, you can use these posts as resource for a variety of great class options! Let's get on with the fitness! Welcome to the first post in the Fitness Around Albany series! Recently I got a chance to visit the yoga and personal training studio The Balance Loft in Troy, NY. This little studio is located in the historic district of Troy on a scenic stretch of shopping, restaurants, and other local stores. When I entered the studio, I was immediately greeted by studio owner Kelly and instructor Adam at the reception desk. The studio had a very calm atmosphere with scents of eucalyptus and other relaxing aromas. After chatting with Kelly and Adam for a bit, I checked in for the class and put my things in the cubby area in the back of the studio. There were no lockers, but the studio itself is locked during classes, so no one is able to come in while the instructors are teaching. reception/waiting area complete with cucumber mint water! I grabbed my yoga mat, water bottle, and sweat towel and headed into the yoga studio (pictured below). When I walked in, the studio was dimly lit (much more soothing than the picture below). It was quite warm, but the air was calming and not very humid so I could actually take deep breaths and feel relaxed. Previous hot yoga classes I have gone to have been incredibly humid and the air a bit stifling. I was pleasantly surprised that this wasn't the case here. The studio itself is heated using Far Infrared heating elements in the ceiling that warm the objects in the room directly, but not the air in between (source). This is an ideal way to heat a yoga studio and actually has many health benefits including positive effects on metabolism, increased white blood cell count, and therapeutic effects on joint pain (source). Adam started the class of 4 with an introduction to what we could expect, asked us if we were new to yoga (I was and still am) and told us that he is a liberal yoga instructor meaning that we should allow ourselves to explore each pose and do our own thing as well. We started the class with some deep breathing on our backs and slowly worked our way up to some stretches on the mat. We progressed into some holds, all while focusing on our breath, which I have since discovered I really need to hone in on. I cannot for the life of me remember any of the names of the poses we held (again, new to yoga here! ), but I do remember some of them being quite challenging and taxing on the muscles. One thing I loved about Adam's style of teaching was he allowed us to be beginners. He made me feel okay with not having perfect balance, falling out of poses, not being flexible, etc. One of the major take aways from his class for me was when he said to allow your body to be stronger and more flexible on one side versus the other and to not hold both sides of your body to the same strength and flexibility standards. Most of us are naturally stronger and more flexible on our dominant side, and sometimes we put a lot of pressure on ourselves to perform the exact same way on our non-dominant side. It was a nice reminder that sometimes that's not possible, and that's perfectly okay. Toward the latter portion of class, we progressed into a few binds, which I found I really enjoyed. (For anyone completely new to yoga, a bind is a pose that links the hands together while also twisting the torso and upper body.) My usual fitness routine consists of a lot of strength & resistance training (including the classes I teach), so purposefully stretching my body felt really good. My favorite bind was Marichyasana, which I couldn't do fully without the assistance of the yoga strap. The bind challenged my incredibly tight hips, opened my chest, and definitely stretched my shoulders. After practicing a few more binds led by Adam, we started stretching again and ended up in Happy Baby Pose (another great one for my hip flexors). He let us explore different variations and stretch any other areas we needed to on our own. I loved this portion of class not only for the stretching (which I don't do nearly as often as I should), but also because he let us BE with ourselves. Yes, it might sound cheesy, but experimenting with what feels good for you, what your limitations are, and what ways you can challenge your body are all great self-exploration practices that this class really allowed. At the very end of class, Adam came around with a cooling eucalyptus face towel which felt AMAZING after sweating profusely for an hour (proof below!). We ended class in traditional Savasana (lying on your back, arms by your sides, legs out straight and completely relaxed), took a few deep breaths, and toweled off. 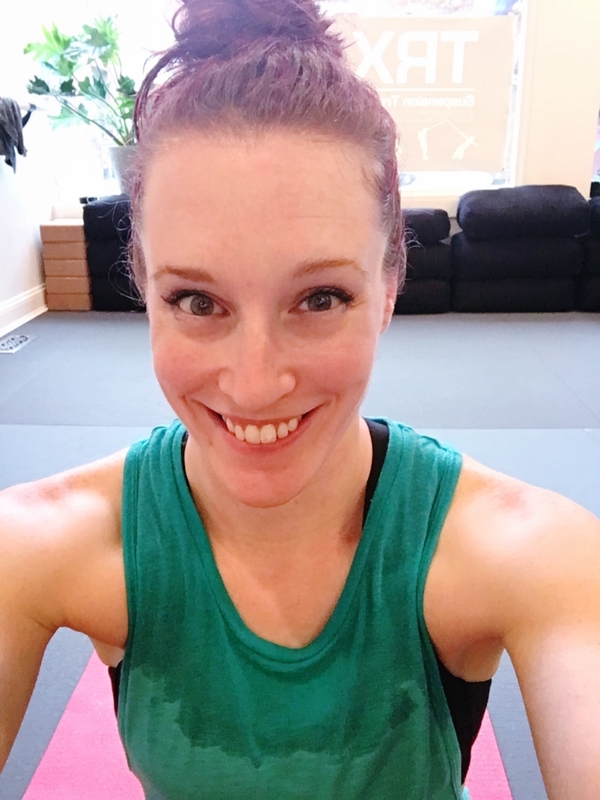 Perhaps it was the instructor, or the small class size that day, but this yoga class opened my eyes to a completely positive experience with yoga. My previous experiences were okay, but they didn't leave me feeling as calm, centered, and positive as this one. I learned a lot about both yoga itself and where my strengths and weaknesses are. My big take aways from my practice are that I need to work on synchronizing my breathing with my movement, taking deeper breaths to begin with, and that I need to stretch big time. I'd like to give a HUGE thank you to studio owner Kelly, and instructor Adam for allowing me to take part in their class, and for introducing me to a practice of yoga that I genuinely enjoyed. For more information about The Balance Loft, you can visit their Facebook Page and follow them on Instagram. Readers: chat with me! Do you practice yoga? Have you ever tried a hot yoga class? What are some poses or binds you love or give you trouble? For readers in the Albany area, have you ever been to The Balance Loft before? If not, will you try it?